When the editors of Taste of Home magazine asked their readers for submissions for their Garden Bounty recipe contest, they were inundated with all manner of delicious dishes, from appetizers to salads to vegetarian entrees to fruit-laden desserts. After reviewing all the recipes, they found their winner: Kathryn Pehl, the third 2007 Taste of Home contest winners to appear on The Early Show. Katie hails from Prescott, Ariz., and the judges could not resist her Spaghetti Squash with Red Sauce, especially her flavorful tomato sauce, which is served over spaghetti squash instead of the usual pasta. If you're interested in participating in a Taste of Home recipe competition, the next contest is "Corn is King." You can also still submit a recipe for Slow Cookers. To get more information, click here. This fabulous, meatless main dish is a great way to get the kids to eat lots of vegetables … and a great way for you to use some of the fresh harvest from your garden. — Kathryn Pehl, Prescott, Ariz.
Place squash, cut side down, on a microwave-safe plate. Microwave, uncovered, on high for 14-16 minutes or until tender. Meanwhile, in a large skillet, sauté tomatoes, mushrooms, green pepper, carrot, onion, garlic, Italian seasoning and pepper in oil for 6-8 minutes or until tender. Add tomato sauce; heat through. When squash is cool enough to handle, use a fork to separate strands. Place squash on a serving platter and top with sauce. Sprinkle with Parmesan cheese if desired. Yield: 6 servings. Nutrition Facts: 3/4 cup squash with 1/3 cup sauce (calculated without Parmesan cheese) equals 135 calories, 4 g fat (1 g saturated fat), 0 cholesterol, 372 mg sodium, 25 g carbohydrate, 6 g fiber, 4 g protein. Diabetic Exchanges: 2 vegetable, 1 starch, 1/2 fat. Place apples on an ungreased baking sheet; brush with 2 tablespoons syrup. Broil 3-4 inches from the heat for 3 minutes. Turn; brush with remaining syrup. Broil 3-5 minutes longer or until crisp-tender. 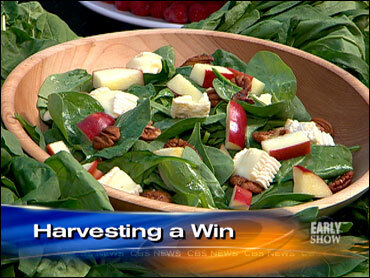 In a large salad bowl, combine the spinach, cheese, pecans and apples. In a small saucepan, combine the dressing ingredients and bring to a boil. Pour over salad and toss to coat. Serve immediately. Yield: 10 servings. My children wanted to plant a garden, and we ended up with buckets of cucumbers. When I got tired of making pickles, I came up with these pretty little sandwiches. We made 200 of them for a family gathering, and everyone wanted the recipe. — Kimberly Smith, Brighton, Tenn. In a small mixing bowl, combine the first eight ingredients; beat until blended. Stir in the cucumbers, red pepper, onion, olives and parsley. Cover and refrigerate for up to 2 hours. Remove crusts from bread; cut each slice into four triangles. Spread with cream cheese mixture. Garnish with cucumber slices and dill sprigs if desired. Yield: 4 dozen. Everyone in our extended family loves to cook, so I put together all of our favorite recipes in a cookbook to be handed down from generation to generation. This recipe comes from the cookbook. It's a delicious twist on traditional potato salad. — Suzette Jury, Keene, Calif.
Place all of the potatoes in a Dutch oven; cover with water and bring to a boil. Reduce heat; cover and simmer for 15-20 minutes or until tender. Drain and rinse in cold water. Cut into 1-inch chunks. Place the potatoes in a grill wok or basket. Grill, uncovered, over medium heat for 8-12 minutes or until browned, stirring frequently. Transfer to a large salad bowl; add onions. In a small bowl, whisk the oil, vinegar, mustard, salt, celery seed and pepper. Drizzle over potato mixture and toss to coat. Serve warm or at room temperature. Yield: 6 servings. Editor's Note: If you do not have a grill wok or basket, use a disposable foil pan. Poke holes in the bottom of the pan with a meat fork to allow the liquid to drain. Our family loves raspberries, and this pie keeps the flavor and firmness of the berries intact. The combination of the berry-gelatin and cream cheese layers keeps everyone coming back for seconds. — Allison Anderson, Raymond, Wash. In a small bowl, combine the cracker crumbs, sugar and butter. Press onto the bottom and up the sides of an ungreased 9-inch pie plate. Bake at 350 degrees for 9-11 minutes or until set. Cool on a wire rack. For filling: In a small mixing bowl, combine the cream cheese, confectioners' sugar, milk and vanilla. Carefully spread over the crust. For topping, in a small saucepan, combine the sugar, cornstarch and water until smooth. Bring to a boil; cook and stir for 2 minutes or until thickened. Remove from heat and stir in gelatin until dissolved. Cool to room temperature. Refrigerate until slightly thickened. Arrange raspberries over filling. Spoon gelatin mixture over berries. Refrigerate until set. Yield: 6-8 servings.